Our production facility in Europe has a top-of-the-line full service plating & galvanics department, completely capable of handling anything we can throw at them. DMM processing reduces the number of steps in the plating process. The copper plate that is actually cut with your music via DMM Processing is the mother. To give us the ability to repress your titles, we safely store these mothers for at least 3 years, longer if requested. Stampers are made by electroplating nickel onto mothers (metal/copper plates), essentially “growing” an inverted mould of the original mother, which can then be separated from it, cut down, moulded and shaped to fit the vinyl press it will be used on. The stamper is then attached to the press and used to press the grooves into the vinyl. 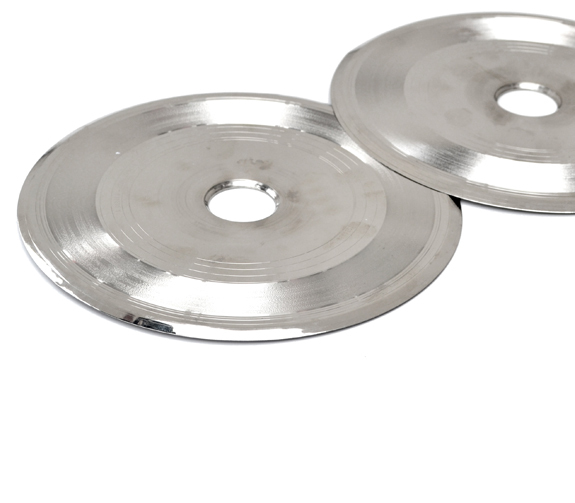 Pressing vinyl records over and over again is hard on metal stampers, causing them to wear out over the course of a pressing. A set of stampers is usually good for around 1000 pressings. As long as they are kept in good condition, you can make virtually endless stampers from a single mother. Once a stamper has been used it is recycled. Our plating & galvanics department is as experienced and skilled as anyone in the industry, thus we are easily capable of processing your outside parts, whether they are lacquers, mothers, fathers*, or stampers. While you do miss out on the advantages of having us cut your record with state-of-the-art DMM technology and the process of using outside parts does have a tendency to cost more, we are more than privy to all of the intricacies in this business and fully understand the need to offer this service and excel at this step in vinyl manufacturing as well. We are happy to handle (affordably) shipping your parts to our offices in Europe too – just let us know about your situation and ask about your options when requesting a quote. *A NOTE ABOUT FATHERS – When DMM Processing is used a father is not needed. If you supply a lacquer, a father must first be created from the lacquer. This creation of a father is similar to the electroplating used to create stampers, only unlike the copper plates which you can make endless stampers from, the lacquer is most commonly destroyed in this process. This nickel father plate is then electroplated one more time to create a mother, which can be used to then create (endless) stampers. The extra steps involved in the processing of a lacquer, not only requires more work, takes longer, involves more risk and costs more, but also literally makes your grooves less representative of the original cut. Clearly a mould of something will be more true to the original (and easier to make!) than a mould of a mould of the original. That simple metaphor illustrates one of the most basic advantages to DMM processing.